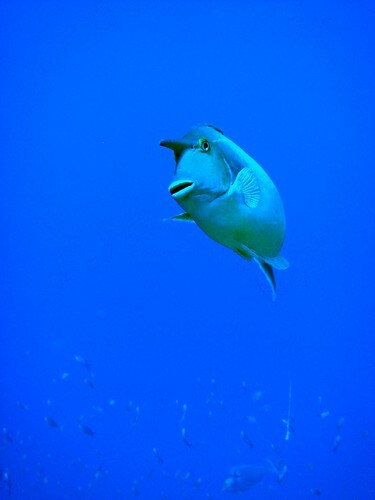 Unicorn fish, Shark Reef, Ras Mohammad, Egypt, originally uploaded by Craig Grobler. The unicorn fishes are 17 species of tropical marine surgeon fishes in the genus Naso. They are so named because of a spike that protrudes from its forehead; however some species have a bulbous protrusion rather than a pronounced spike, and some lack a spike altogether. Unicorn fishes usually have a pair of spines on each side of the tail shaft that are used for defence.